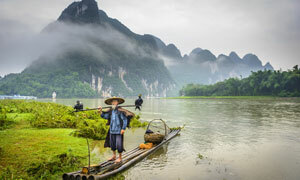 Upstream: A four-night and five-day cruise from Yichang to Chongqing or a eight-night and nine-day cruise from Shanghai to Chongqing. 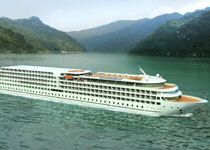 Also read Differences between Upstream and Downstream Cruises. 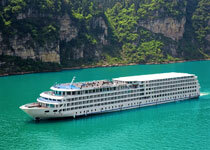 Most cruises are between Yichang and Chongqing, the favorite cruise route with our customers. The most popular cruise company is President Cruises, which has superior five-star cruise ships with high-end service. Shore excursions vary according to ships and schedules. All cruise routes pass by the Three Gorges Dam, Daning River Lesser Three Gorges, Shennong Stream, Fengdu Ghost City, Shibao Village, and Fengjie (White Emperor City), where you can stretch your legs on a guided tour. Although Yichang is often overlooked by travelers, who travel straight through to board a Yangtze cruise ship, Yichang has a freshness and tidiness, and has some picturesque natural sights in the vicinity. 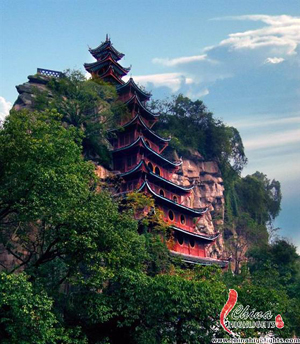 China&apos;s largest municipality, Chongqing, has a number of tourist attractions. 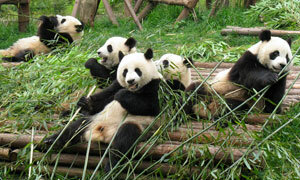 You can reach Chengdu to see giant pandas from Chongqing with only a few hours’ drive. The difference between upstream and downstream cruises is that downstream cruises are normally shorter. The prices of upstream and downstream cruises are the same for most cruise routes except for cruises between Chongqing and Shanghai (where the upstream price is more expensive). Also shore excursions may vary due to different schedules. In Chinese peoples’ opinion, downstream means "plain sailing", therefore many Chinese people tend to choose downstream. In fact, both upstream and downstream have their advantages and disadvantages. The choice of upstream or downstream depends on your travel schedule and what is important to you. Cruising downstream is faster than travelling upstream: about 29 kph (18 mph) compared to an average of 16 kph (10 mph); therefore downstream cruises are shorter. Downstream cruises are suitable for people whose traveling time is limited. 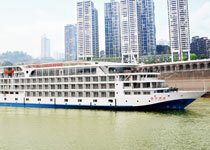 Cruises from Chongqing to Yichang (downstream) take four days, while cruises from Yichang to Chongqing take five days. 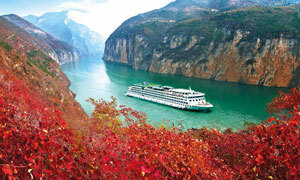 Cruises from Chongqing to Shanghai (downstream) take seven days, while cruises from Shanghai to Chongqing take nine days. Generally speaking, downstream ships dock in the evening and never travel at night. Therefore there is no rocking motion during nights, which may affect passengers’ sleeping or nighttime relaxation on upstream cruises. Even people who are very sensitive to motion sickness or are light sleepers can have the best chance of a good night’s sleep. Furthermore, all the scenery is passed during the day, so passengers do not miss any beautiful scenery during the hours of darkness. 3. Upstream and downstream prices are the same for most cruise routes. 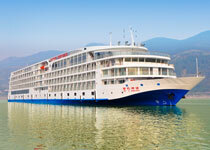 However, downstream is cheaper for cruises between Chongqing and Shanghai. 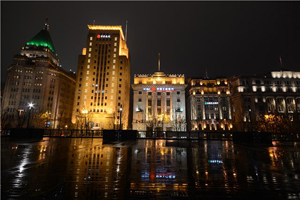 (Only Victoria Prince Cruises run between Chongqing and Shanghai.). 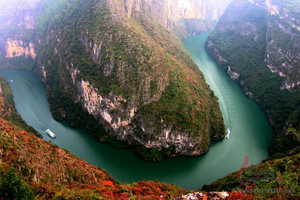 Downstream and upstream shore excursions for cruises between Chongqing and Yichang are the same in number (Most cruisers run between Chongqing and Yichang). The average speed of an upstream cruise is 16 kph (10 mph) compared to 29 kph (18 mph) for downstream cruises. Passengers have more time to enjoy the charming scenery, listen to the explanation of the attractions, ask questions about the attractions and take photos. 2. A longer cruise allows you more time to find about Chinese culture, history and customs through the greater number of shows and longer commentaries. Due to the slower speed, cruise ships travelling upstream have to travel at night in order to reach shore excursion destinations and scenic attractions in daylight hours. It may affect passengers’ sleeping and inevitably some scenery will be passed by at night, but the journey is arranged so that the highlights are seen in the daytime. 2. The prices of upstream and downstream cruises are the same for most cruise routes, but the upstream price is more expensive for cruises between Chongqing and Shanghai (Only Victoria Prince Cruises run between Chongqing and Shanghai).